1. To secure the booking, we require a refundable or deductible deposit of R100 per person. This can be used toward payment of your bill or to be refunded\credited to your preferred account. 2. On weekends (Friday and Saturday) there is a min amount to be spent of R200.00 per person. This is an average spent of the total bill of the entire table\group. 3. We do not have a cover charge and do not charge any extra for the entertainment supplied, therefore, a minimum service charge of 15% will be added to the bill. 4. To enable us to serve at the standard we demand of ourselves please note that all tables of 8 or more will be required to take a set menu. 5. Special Set Menus (items that are not on our menu, are to be paid for in full 48 hours before the function). 7. The bill must be settled in full, including gratuity on the evening. 8. This booking is subject to confirmation from Stardust. 9. 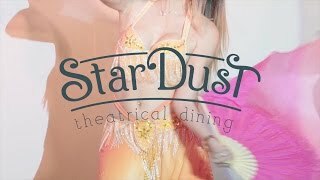 Stardust reserves its right to increase prices from time to time The price of the food can be secured by full payment upfront for the set menu ordered.